'Z' wouldn't want team to skip game By Tim Roe, Vacaville Reporter September 27, 2008 Anguish? Yes! A rain check? No way! As news of Tom Zunino's death spread across the Vacaville High School campus on Friday, Bulldog football coaches thought about the churning mix of emotions they would feel as Vacaville traveled to play Granite Bay later that night. They didn't think about not taking the field. "We'd be in trouble with 'Z' if we did that," said Ed Santopadre, an assistant coach with the Bulldogs and an assistant principal at Vacaville. "Not playing ... that is not acceptable." Santopadre admitted the Bulldogs would be distracted playing the Grizzlies. "We're kind of empty," Santopadre said. "I don't know if it's quite, 'Win one for the Gipper,' but it obviously plays in. "It's another emotion we have to deal with ... an emotion we're not familiar with." Indeed. It took a battle with cancer to move the man known simply as "Z" away from the sideline. Zunino was the architect of the Bulldog program, at least in the modern era. He was the head varsity coach from 1961 to 1997, compiling a 215-145-12 record. He continued on as an assistant coach even after he "retired," and came back in an even greater capacity in 2006 as the team's defensive coordinator. The Bulldogs won the Sac-Joaquin Section championship and finished with a school-record 13 wins against one loss. Last year, Monticello Empire League-rival Napa handed Vacaville its only regular-season loss and went on to win the section crown. "Isn't it ironic that the two years he came back full-time, MEL schools won the section?" Bulldog assistant coach and longtime friend Fred Jones asked. "Is that ironic, or is that the mystique of 'Z?' "He was instrumental in the formation of the MEL, and he made it one of the strongest leagues around. He raised the bar. He challenged everyone to be better. He's probably has done more for high school athletics than anyone in Solano County." 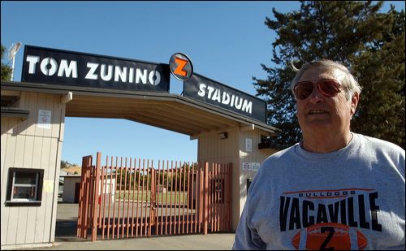 In addition to helping mold the MEL, Zunino was the driving force behind the building of the stadium that now bears his name, as well as other facilities at Vacaville High. "It's a sobering day for us at Wood, because in reality, he did start our program, too," said Mike Boles, the Wildcats' head coach. "So many people here either played for him, were around him, or taught with him. "His name is synonymous with Vacaville, with Vacaville High School, with the Bulldog culture. I didn't know him really well, but I knew enough to call him 'coach.' " The respect Zunino earned was evident on a variety of fronts. His awards are too numerous to mention, and he is a member of the Sac State Hall of Fame, the Solano College Hall of Fame and the Vallejo sports Hall of Fame. "I know he won state athletic director of the year a couple of times ... but I know he wasn't really into awards like that," Jones said. "Every once in a while I would go over to his house and there would be a new plaque on the wall. That's how I found about some of those things." Perhaps the biggest honor came in 2004, when Harold Youngblood Stadium was renamed Tom Zunino Stadium. "He deserved that," Jones said. "He built that stadium with his own sweat equity."